Large apartment in a renovated historic building XIX century located in the historical and tourist center of Madrid. Renovated and restored for four people, twoo of them in a large easily open bed safa. Located in Cava Baja street close to Plaza Mayor in the best tourist entertainment area: restaurants, tipical tavers, theaters, monuments and El Rastro flea market. It´s exterior, bright. Personal attention by the owners. English and french are spoken. This apartment was where I lived for a long time. Location, it´s close to everything in the historic center, walking access to all the places in downtown. This on a busy street with all services at hand and the apartment is not noisy. There is a spacious shower cabin. Air conditioning in lounge and bedroom. It´s own ADSL Internet Connection. Available Italian coffee machine and water heater machine. Full cutlery, dishes, pots and pans. There is a folding dining table for 6 people; a desk table and a comfortable spacious three-seater sofa; which converts easily into a bed (150x190 cm). There is an outside balcony. Will rent this place again when I return to Madrid. Location is VERY CENTRAL part of Madrid. We walked everywhere. Jose the owner was EXCELENT, extremely quick to respond to email and meet us when our arrival time changed. Apartment has Heat , AC, refrigerator, washing machine stove top plates cookware just like home. Place is cozy small good for two people VERY TIGHT for 4 people with a uncomfortable pullout queen sofa as 2nd bed. Apartment is in a very old European style apartment building with paper thin walls. Apartment s on 3rd floor (by US standards) With NO lift. EXACTLY 60 wood VERY LOUD windy steps up to the apartment. The hallway steps to the apartment echo's constantly as inconsiderate people in adjoining apartments above and below you come and go screaming banging and clanking all night long up and down the solid wood steps. Walls are paper thin and hear everything from neighbors at 2-3AM. Hot water for shower is very limited 6 min before it gets cold. Need to be quick. Again , Owner Jose was amazing, location perfect for 2 people, but hard to sleep with all inconsiderate crazy neighbors . I feel so sorry that you have had noise problems with some neighbor. I will try to find out what has happened to try not to happen again. It´s so clear on the web , both in text and in the photos, that it is a historic building and a third floor without elevator. We will continue to focus on this issue. The property was clean, welcoming and well equipped with everything we needed for our stay. Its situation is ideal - a lively area with lots of bars and restaurants, in walking distance of many sites and near the Metro. The bedroom was at the back of the property and very quiet - we certainly slept well. We were able to leave our heavy luggage until late when we went to the airport and the owners kindly met us outside the apartment with it at 18:00. We enjoyed Madrid but there is much to see and experience so we will be back soon. 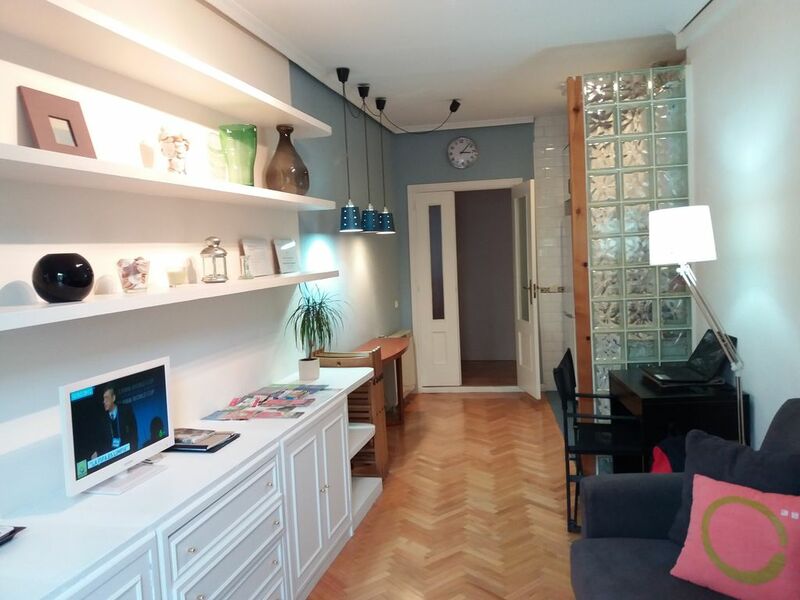 We are pleased that you´ve enjoyed the apartment and your stay in Madrid. We appreciate your evaluation and hope to have you again in Madrid. José Miguel gave us a great introduction of the apartment and a lot of useful tips to have a great time in Madrid. The apartment is perfect for a couple, being perfectly equipped with everything a visitor needs. And the location is amazing, about 5 minutes from Plaza Mayor, with nearby supermarkets, and best of all, the best taverns and tapas bars in town. We will recommend this property to our friends and family and to anyone who reads this review. Me alegro de que hayáis estado a gusto en Madrid y en nuestro apartamento. Espero que haya ocasión para vernos de nuevo. Hasta entonces, que todo vaya bien. We had a very nice stay. Jose Miguel was very accommodating. The apartment is on a wonderful street with lots of great restaurants. Public transportation is very close and you are within walking distance of the Royal Palace and other sights. Be aware that this apartment is up several flights of stairs, we didn't mind, and since we ate so well it was probably good for us. It can also be noisy on the weekend since the street is such a popular area. The bedroom is in the back so we didn't have our sleep interrupted. We enjoyed our time in Madrid very much. It´s located in the best entertainment area of Madrid, restaurants, taverns, theatres and El Rastro flea marquet sundays&holidays mornings. In Barrio of Austrias, close to Palacio Real, San Francisco el Grande Church, Plaza mayor, Almudena Cathedral, Puerta del Sol etc. It´s only two underground stops from El Prado and Thyssen Museums.Walking access to all tourist areas of downtown Madrid in less than 20 minutes. Close to Puerta del Sol area where yuo can find El Corte Inglés big store, Preciado´s Street stores and San Miguel Market. Tarifas decrecientes en función de la duración, tarifa en función del número de personas.